When it comes to Influencer Marketing, it seems like analytics are often a forgotten piece of the process. While much attention is given to identifying influencers, researching them and the paid conversion that happens in order to bring them on as an influencer, the analytics of the arrangement is often an afterthought. Effort requirements are almost always part of the contract with an influencer. For instance, if Holiday Inn commissions an influencer to run an Instagram Loyalty Program campaign for them, that influencer might be asked to produce X number of Instagram photos per week on their personal account. Those ‘effort’ metrics are all well and good and certainly help a program, but to truly measure the impact of an arrangement with an influencer, the brand must go deeper into the numbers to find the value. What is happening after posts are published? How deeply a brand goes into that value calculation depends on a number of factors, including budget, available human resources and tool allocation, to name a few. There’s no absolute right way for measuring the success and effectiveness of an Influencer Marketing campaign (in fact, this often varies based on the campaign goals), but there are a few best practice recommendations we always give to our clients. Three baseline metrics to pay attention to are Impressions, Reach and People Engaged. These are all KPIs supporting increased awareness and/or engagement for your brand, and they can all be directly tied to the work your influencers are doing on your behalf. Determine benchmark measurements for each of them, so that as your Influencer Marketing campaign increases, you can compare the data to your benchmarks. They should all show healthy growth. If you’re using a platform or tool to manage your Influencer Marketing campaigns, it should measure these for you. If you’re going the organic route, you can measure them manually, but it takes a good amount of time to do so. After you’ve completed a few Influencer Marketing campaigns and have measured the progress you’ve seen from them, you have enough information so you can set goal KPIs for your influencers in the areas of Impressions, Reach and People Engaged. Clicks to Website or Online Purchases – if you’re trying to drive people to your site or to make a purchase, you can give each of your influencers trackable, tagged URLs to share with their followers. This allows you to measure the direct impact of each influencer’s activities. Resource Allocation – because of successful influencer marketing campaigns, was your company able to allocate more budget or resources toward another goal, which boosted profits, awareness or engagement by X%? This is an advanced metric, but one that can help with showing real, business results and can even be used to obtain additional budget. The exact metrics you use will vary by program, but the important thing is that you’re doing some kind of measurement to gauge the progress, success and effectiveness of your influencer marketing program. Since you’re paying these influencers, you want to see that they’re driving real results for you. Put yourself in a modern day traveler’s shoes – does it seem like a constant race to gain loyalty points? Have you enrolled in multiple programs but only stay devoted to a select few? Does every interaction with a hotel seem more like a transaction than a connection? As our choices have expanded, so have our expectations; both have indubitably influenced our behaviors as consumers in some way. The ubiquitous nature of social media means expecting swift responses about our questions and needs. Disruptive business models such as Airbnb’s and design-based hostels’ afford travelers the variety, flexibility and unique experiences they now seek. Some would argue that the millennial generation’s expectations have ushered in a new path to loyalty that requires part emotion, part data science. It’s a loyalty arms race. In order to stay ahead, hotels must exceed basic expectations by recognizing and rewarding members for doing things they already love to do. But where to begin? Look to your data. You’ve stored it with details from past interactions, and you can fine-tune it with further research. As your marketing team determines the types of behaviors that constitute loyalty, don’t forget the technology layer. Using Mattr, hotels can reconcile loyalty program databases to find active members and offer them thoughtful rewards and benefits. 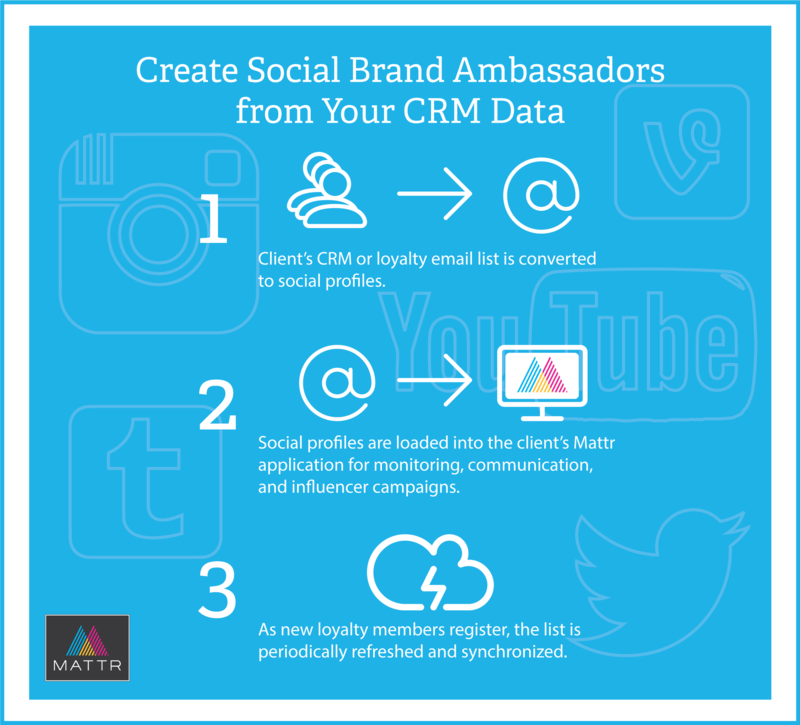 Not only can the Mattr app pinpoint social updates that warrant a “surprise and delight,” but it can also arrange the data to prioritize communication to members with a high reach and highly relevant content. Teams with limited resources can benefit from this practical app feature. Surprise and delight campaigns can also kickstart inactive participation and, hopefully, influence positive behavior in the future. Reactions to such campaigns can be used to improve services, evaluate new ideas, and generate renewed interest in the hotel brand. Hotels have a unique opportunity with loyalty programs to create an emotional bond with their consumers rather than a transactional relationship. Odd as it sounds, using technology to help manage your loyalty program can help you get back to doing what those programs were originally designed to do – creating true, authentic loyalty.